It’s the best time to buy a smartphone, which also means that it’s the worst time to buy a smartphone. Confused? Paralyzed? Welcome to the club. There’s always something great on the market to buy, but if intuition serves you right, something even better could be just over the horizon. We’ve got to be straight with you: the start of the year is the worst time to buy a new smartphone. Don’t do it. Resist the urge. You’ll be rewarded by your patience in just a few months when 2018’s heavy-hitters swing for the fences. If you’re waiting for the next flagship, we’ve listed the features worth waiting for below. And thankfully, the laws of supply and demand reward those looking for last year’s model on a discount, as well, so keep an eye on our updated list of best phones. We’ve also added some models we expect to see deeply discounted as 2018 plows onward. Win-win. Qualcomm’s new mobile chipset, Snapdragon 845, will bring the usual set of upgrades to 2018’s smartphones. As such, you can expect a boost in speed, an increased ability to handle robust applications with finesse, and greatly enhanced battery life for power users. Touching more on the battery performance, we’ve been told that the Snapdragon 845 will yield 30% better performance when it comes to gaming, watching video, or using VR and AR applications. 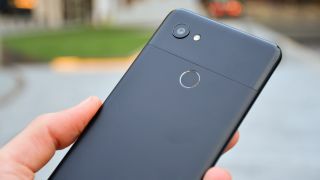 It also has the potential to bring HDR video capture to smartphones packing the chipset, meaning you’ll have even more HDR content to share or watch on your HDR-ready screen, which are very likely be the standard moving forward for high-end phones. This futuristic smartphone feature has been promoted from an “if” to “when” thanks to the launch of the Vivo X20 Plus UD. It takes the trusty fingerprint sensor and embeds it into the display, essentially making it invisible to the naked eye. While no other 2018 flagship smartphones have been confirmed to carry an in-screen fingerprint scanner, is next trend for makers should jump on. As far as how that will give you the advantage versus what your current phone has, it’s mostly a cosmetic gain at this point. When we saw Vivo’s smartphone at CES 2018, we noted that the fingerprint sensor built into the all-screen display works as intended, though noticeably slower than what we’ve seen implemented in even mid-range phones, let alone the cream of the crop. Still, the cool factor is undeniable and it might be worth waiting for if a phone’s worth to you is tied to how it looks. There are few technologies that have improved as quickly in such a short amount of time than the mini, but mighty cameras inside of a smartphone. Just in the past three years, the pictures taken with the most expensive, capable devices on the market have gone from “not bad” to “pretty good” and recently, a bit further to “actually good”, which is what you’ll experience today with phones like the iPhone X, Google Pixel 2 and the Samsung Galaxy S8. But of course, progress never ends, so this year’s flagship devices look to up the ante even more. Samsung is first, which will announce the Samsung Galaxy S9 at MWC 2018 at the end of February. The company has teased that it is taking its camera tech back to the drawing board, but hasn’t yet explained how exactly it will improve over last year’s excellent effort. However, that hasn’t stopped the rumor mill from providing a few unofficial, yet interesting details. Samsung's big improvement seems to be the aperture, which is rumored to operate on a variable f/1.5-2.4 scale. The current leader in low-light shooting is the Google Pixel 2 thanks to its advanced machine learning camera software. It remains to be seen how the S9 will perform, but if the numbers provide the results we’re hoping for, the S9 could take the cake. Other camera features that will play big into 2018’s most alluring phones are optical image stabilization (OIS) for both the front and rear-facing cameras, and packing in a dual-set of lenses for each side to make photos rich with depth and detail. The unsung hero of what makes for a successful camera on a phone its software. While phones like the LG V30 made bigger promises than it could fulfill in terms of camera performance, its robust camera software made using practically any other phone’s snapper a bit dull in comparison. Generally, it’s hard to fail at finding a worthy smartphone these days. Given the breadth of options available at a wide range of prices, there’s something for everyone. But if you’re only out for the best of the best, it’s worth waiting for the right time. Thankfully, the time to buy has almost arrived. Have you seen the Samsung Galaxy S9 and Galaxy S9 Plus?